Leading roofing company, Rydale Roofing, has hit the heights with the award of Gold Excellence accreditation from the National Federation of Roofing Contractors. Rydale Roofing is the only roofing company in North Staffordshire to gain the 2016 NFRC Safety in Roofing Gold award and one of just two in Staffordshire. “We are proud members of the NFRC as it assures the highest standards of quality and service to customers,” said Julie Mirowski of Rydale Roofing. “Our company has made a commitment to growing through quality and we ensure our workforce is trained to the highest industry standards. 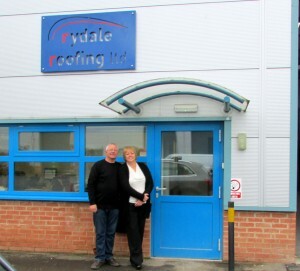 Founded in 1993 by Mick Mirowski, Rydale Roofing employs 15 people from its base at the Silverdale Enterprise Park. The company has grown to take on major contracts in the Midlands and beyond and is a main contractor for roofing with Newcastle-under-Lyme’s Aspire Housing.